Sealaska Heritage Institute (SHI) will kick off its biennial Celebration next week, marking the 34th year since the inception of the popular dance-and-culture festival. It’s a time when Tlingit, Haida and Tsimshian people come together to celebrate their survival as a culture and also share their culture with the public, said SHI President Rosita Worl. “Everyone is welcome at Celebration. We hope that non-Native people will attend our event. We want people to come and learn and celebrate with us,” Worl said. Along with dance performances, Celebration features associated events, and SHI is introducing a few new ones, including a Native Fashion Show, Juried Youth Art Exhibit, a Ravenstail and Chilkat weaving presentation and class, a comic routine and a jazz piano concert (See accompanying press release "What’s New"). Other events include a Juried Art Show and Competition, a Northwest Coast Art Market, seaweed and soapberry contests, a Toddler Regalia Review, film screenings, lectures, Native language sessions and a language open house, an artists gathering and a parade through downtown Juneau. The Juneau Symphony will also give a performance at Marine Park. Events will be held in numerous venues, including Centennial Hall, the Walter Soboleff Building, the Juneau Arts and Culture Center (JACC), the Elizabeth Peratrovich Hall, Marine Park, Gold Town Theater and the Andrew P. Kashevaroff Building (formerly the Alaska State Museum). The 2016 theme is “Haa Shuká: Weaving Traditional Knowledge into our Future.” The institute anticipates up to 6,000 people, including nearly 50 dance groups and more than 2,000 dancers from Alaska, Canada and the Lower 48. SHI also will host the O’Shea-Ryan Irish Dancers, an Irish group from Australia (See accompanying press release "SHI to host internationally-known Irish dance group at Celebration"). Celebration 2016 will be led by the Git Hoan Dancers. The first event will be a presentation by Ravenstail and Chilkat weavers from 11:30 am to 2:30 pm, Wednesday, June 8, in the clan house at the Walter Soboleff Building. The presentation will be followed at 4 pm by the awards ceremony for the Juried Art Show and Competition and new youth art exhibit (See accompanying press release "SHI to unveil winners of Juried Art Competition, Youth Art Exhibit"). The Grand Entrance procession into Centennial Hall will begin at 6 pm at the Elizabeth Peratrovich Hall and Celebration will wrap on Saturday, June 11, with a Grand Exit procession. SHI will sponsor a live, statewide broadcast of Celebration on public television’s 360 North and a live webcast. Live coverage will begin with Grand Entrance on Wednesday. Tickets will go on sale at 9 am, Wednesday, at Centennial Hall. Four-day passes are $30 for adults, and $15 for Elders and youth (ages 7-12). One-day tickets are $15 for adults, and $10 for Elders and youth (ages 7-12). Children ages 6 and under are admitted at no charge. The program is available at admissions tables at Centennial Hall and the Elizabeth Peratrovich Hall. Celebration is a financial boon for Juneau, according to research. A study by the McDowell Group in 2012 found that the economic impact of Celebration that year was $2 million during the four-day event. 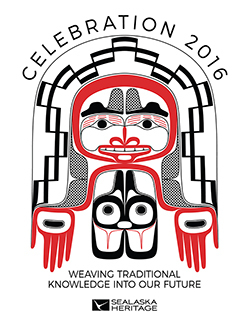 Caption: Celebration 2016 art designed by David R. Boxley.